Sweet Virginia is a dark, slow-burn thriller with certain boilerplate plot mechanics that’s eventually trumped by the cumulative power of its spellbinding visuals and wonderful cast. Director Jamie Dagg’s solid command over the imagery and material proves he is ready for a bigger canvas. Sweet Virginia (2017), scripted by Benjamin and Paul China (billed as ‘The China Brothers’), is a neo-noir with standard plot elements. The script isn’t exactly lackluster but then it doesn’t go particularly deep with its themes or that it is anchored by harsh truths. Nevertheless the movie’s huge redeeming factor is Jamie M Dagg’s directorial approach whose elegant, immersive imagery relentlessly thrives with a sense of dread and unease. Jamie Dagg’s ultra low-budget debut feature ‘River’ (2015) was a chase thriller set in Laos. River too had a simple ‘fugitive-on-the-run’ plot, but the stifling atmospherics and gritty tone proved the director’s meticulous control over the genre material. It’s the same qualities that keep Sweet Virginia above the pack. Bolstered by a talented cast and Dagg’s chilling visuals, the leisurely paced narrative gradually turns into a reasonably good inquiry into the encroaching moral decay weighing upon a peaceful American small town. Contrary to the title, Sweet Virginia is set in a remote town around the dense woods of Alaska. The titular place is a small roadside motel, run by a heavily bearded guy named Sam (Jon Bernthal). He is a former rodeo champ and a celebrity of sorts back in Virginia. Now he has left that past and inherited the motel from his deceased brother. Unbeknownst to Sam, the motel, name of which emits the alleged small-town folksiness and friendship, remains as an important backdrop for the upcoming downward spiral. The semblance of peace is threatened by the arrival of a strange intruder. The film opens with an exasperated, middle-aged man walking into a bar, closed for customers but open for friends. Two of his pals, one old and one young, are involved in heated discussion from upcoming elections to failing business. The middle-aged guy calls his wife Bernadette (Rosemarie DeWitt) at home and tells he is back in town. Before long, a weird young man enters the bar who remains obstinate to the men’s polite instruction that the bar is closed. Soon, the mysterious guy kills the three of them in cold blood and robs the till. The motel’s reception cabin is full of framed mementos, the only remainders of Sam’s heyday. There’s an obscure framed photograph of a woman and a child in his room, whose fate is never spelled out. The way he takes a paternal interest in chatting with the motel’s front-desk girl Maggie (Odessa Young), a smart teen, refers to his irredeemable personal loss. We may not know what Sam’s hiding, but it’s absolutely clear why the strange guest at the motel named Elwood (Christopher Abbott) is hiding there. He has killed the three men at the bar, although his job was to kill only one. Lila (Imogen Poots) who has lost her husband to the shooting has actually hired Elwood. The young widow instantly feels liberated, but a sense of doom slowly approaches her since Elwood is biding his time until she pays. Since the motel ‘Sweet Virginia’ isn’t situated near any great vacation spot, the guests are mostly moody and keep to themselves. But Sam sees Elwood is an exception. He soon learns the connection between them runs deep as Elwood too is from Virginia, and his father has been a big admirer of Sam, in his rodeo days. The restrained camaraderie between the motel manager and sociopath plays a vital role in the later violent chain-of-events. Benjamin and Paul China’s film-making debut was a tepidly received Australian horror Crawl (2011). They have written spec script for Sweet Virginia around the time, which was high on the Black List in 2012 (annual list of the best screenplays in Hollywood yet to be filmed). Despite the familiarities and formulaic nature of the script, the one interesting element is the fair dose of moral ambiguity. The muscular protagonist happens to be deeply vulnerable and the despicably violent villain reveals his humane side in few key moments. The character conflicts aren’t also unnecessarily over-written. Nevertheless, it was director Jamie Dagg and Canadian cinematographer Jessica Lee Gagne who elevates the basic material and allows us to really sink into the action and atmosphere. Shot over 21 days, the visual language perfectly balances its interest in character and piercing gaze at the surroundings (one of the memorable visuals in the film is set on a bridge over a waterfall, the ugly revelation cushioned by the enveloping natural beauty). There’s ample room in the script for staging bloody sequences, but Dagg’s portrayal of violence or the anticipation of violence is nuanced and praiseworthy. Like all good film-makers, Dagg believes in power of suggestion when it comes to the showcase of on-screen violence and so it’s covered in realistic and also distant manner. For example, the brilliant scene, filmed through the parked trucks, when Elwood bumps off two unsavory guys near a phone booth. The scene is shot in a single take, fittingly warns us off Elwood’s instability despite his display of friendliness towards Sam, yet the brutality witnessed is suggestive not particularly visceral. Jessica and Dagg’s interaction between light and shadow, in noir-esque fashion, perfectly complements the melancholy deeply buried within the narrative and characters. In a way, the carefully construed frames are both terrifying as well as resplendent (especially in the moments when masked robbers are seen from dark living room of the house, and the whole tense stand-off sequence in the end). The performances are all top-notch with Abbott once again channeling in the unnerving recklessness we recently witnessed in Josh Mond’s devastating indie drama James White (2015). Both Abbott and Bernthal play characters that largely live inside a self-constructed shell. Yet through fleeting gestures and words, they genuinely convey the tenuous bond that evolves between them. The script isn’t particularly written as a profound character study, although the two lead performers’ restrained turn add interesting textures to the simple set-up. 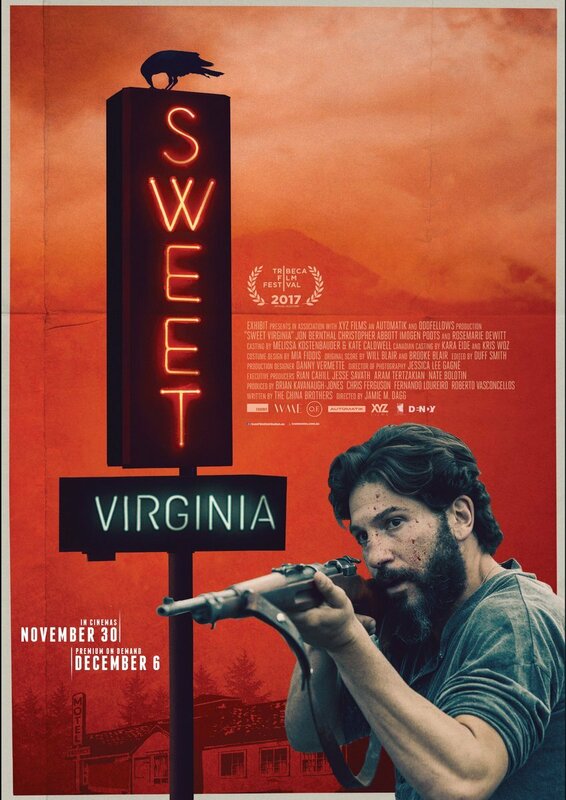 Sweet Virginia (93 minutes) is a dark, slow-burn thriller with certain boilerplate plot mechanics that’s eventually trumped by the cumulative power of its spellbinding visuals and wonderful cast. Director Jamie Dagg’s solid command over the imagery and material proves he is ready for a bigger canvas.